Reading The Secret Life of Bees just meant I had a favorite book. Reading The Invention of Wings means I have a favorite author. Sun Monk Kidd is tremendous, folks. This book pulls at your heartstrings in a way that isn’t cheesy. It’s authentic without being boring, it’s about slavery without chastising, and it’s about abolition without pride (well, at least the bad kind of pride). It gives the bad guys of the story hearts while it keeps the good guys with their feet on the earth. Sun Monk Kidd weaves in so much symbolism you can see it without the help of your English teacher. Instead of feeling overdone, though, the nuances of water and wings and sewing makes the story so full-bodied you feel like you’ll burst. 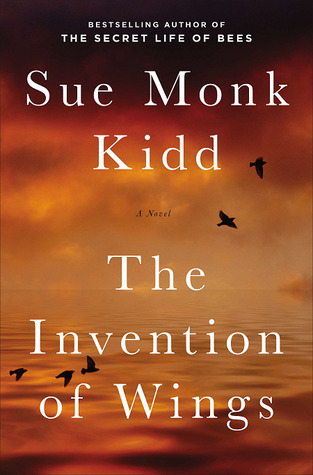 There’s a lot I love about this story but probably my favorite part is how this novel, at first glance, is about slavery and it’s impact on two women – Hetty and Sarah. When you actually read it though, I think each reader will pick out something else that’s important to him/her. For me, I adored how much this book was about women. Men play very minor roles. The men in this story do little more than hinder the women along the way. Each step for these women are taken on their own – and it’s beautiful.